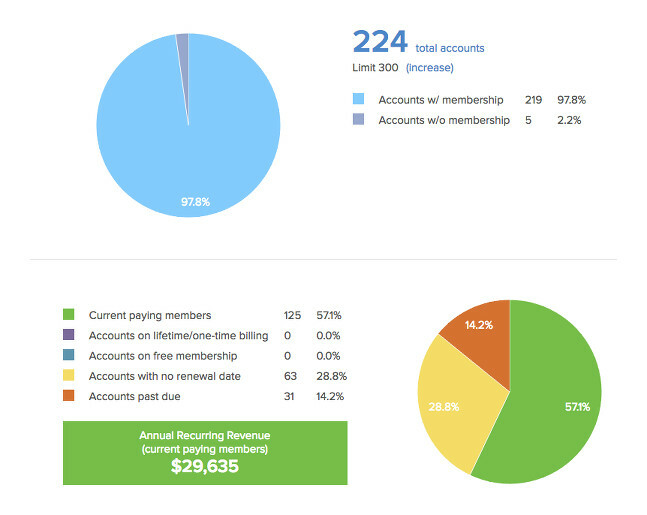 Breakdown of your accounts by account status, membership level, add-ons and labels. Use this to help identify any issues with your membership data, such as accounts with no assigned membership level or renewal date. Click on any line to pull up accounts by status, level, add-ons or labels. Your revenue information by date range and the ability to export financial transaction data to CSV, QuickBooks or Xero. Your new, renewed and lapsed members by date range. The New Members box now displays full date/time as well as the signup notes. Click on any of the titles (New Members, Renewals, Upcoming Renewals or Past Due) to pull up all accounts in that box. Activity in your events by date range. Now you can see sales amount for each registration, as well as any unpaid registrations (amounts in red). Click on any event title to go straight to the event’s dashboard. Activity in your forms/carts/donations by date range, with sales amount for each checkout. Click on any form title to go straight to the event’s dashboard. Timeline activity by date range. You can now search/filter by transaction type and/or tags.